Elevated Andalusian dining from Iron Chef Jose Garces in Battery Park City. : Jose Garces is something of a legend in Philadelphia. 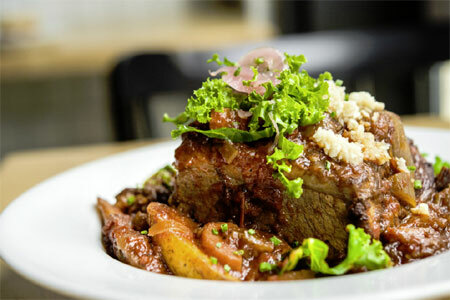 Known for his Spanish-style cuisine, he has elevated the concept of tapas dining. 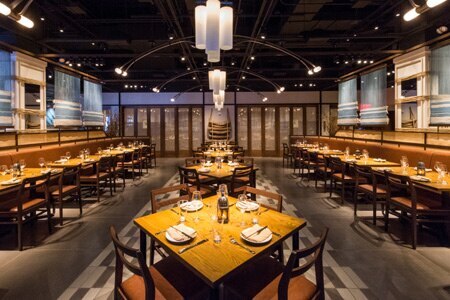 Garces’ return to Manhattan with a third version of Amada --- he cooked previously at the Rainbow Room and Four Seasons --- lands him in the downtown food mecca of Brookfield Place. The gargantuan 248-seat restaurant is divided into a variety of spaces: a front patio area, a bar, a café/wine bar called Amidita, the main room and a pair of private dining rooms. The menu is extensive and broken into categories like “tradicional,” “a la planxa,” “vegetables, fish & meats” and “flatbreads.” Three to four small plates are suggested per person, to be shared. Start with a selection of charcuterie and cheeses from Spain and add the likes of lamb chops, diver scallops and baby squid from the grill. Amada’s flatbread made with artichokes, wild mushrooms, black truffles and manchego will satisfy any vegetarian or non-vegetarian as will the padrones, Spain’s beloved peppers, blistered and served with sea salt and salbitxada from Catalan. For a special twist, order Amada’s suckling pig in advance and it will be carved for you tableside. Dessert inventions include crema Catalana enlivened with strawberry, canela and tangerine lace. A “gin and tonic” menu and an all-Spanish wine list accompany a selection of rare sherries.